Several weeks ago, The Brit and I were walking in downtown Napa and noticed an Italian restaurant called Ca Momi with which we were unfamiliar. Always the nosy one and on the look out for good food, I went over and looked at the menu on the wall outside. One of the waiters noticed me and encouraged us strongly to come in and dine. He touted the place as having “The Best Pizza in Napa”. You all know me by now, when someone makes such a boast, I must see if it is true. I put it on my list of must tries. We did finally dine there and wrote about our experience. When we walked in, the restaurant space was beautiful. A real eclectic mix. Warm woods, brick, modern art, and steam punk type light fixtures were all around us. 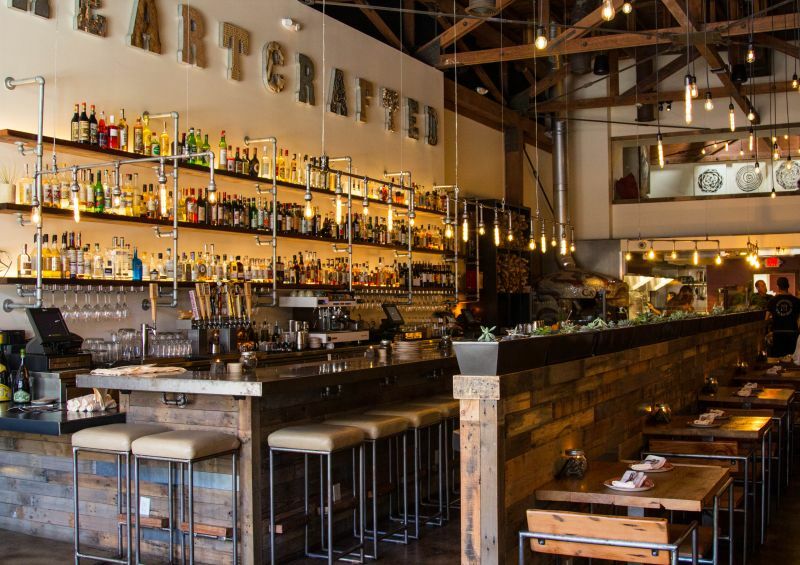 They have a huge bar to one side of the restaurant and what looks like a loft area at the far end. I was very impressed by the decor and the feel of the place. 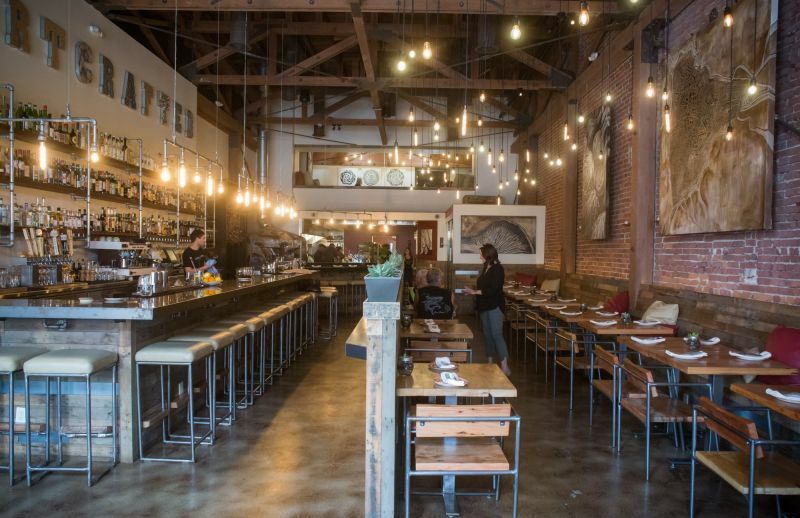 There is a feeling of upscale dining, yet not overly stuffy there. We sat down and we had a lovely lady serve us. She was efficient, knowledgeable, and on point for her service. She knew the menu very well and was willing to help us translate anything we didn’t understand, as the menu is mostly in Italian. We didn’t tell her that both of us are well versed in Italian and could easily navigate the menu without help. We were interested to see how the restaurant handled guests who didn’t read Italian. I want to put a note in here that one of the things about this restaurant is their slogan: “Obsessively Authentic”. For them this means that pizza is served “Italian style” from their recipe and what they have listed is how it is served. There is no Parmesan cheese or pepper flakes served with their pizza. I thought this was an interesting concept. As The Brit and I have spent a great deal of time all over Italy on various trips, I have to say that I was both intrigued and excited. I am a lover of quality Italian cuisine. It is probably my own specialty to cook at home; having been taught by an Italian grandma. I would also like to note here that the restaurant makes zero substitutions. They will not even take ingredients off a pizza. As it is listed, you must order it. It really limited the things I was interested in eating there and for people with food allergies: Stay away period. We started off with a very simple prosciutto and melon appetizer. It is always a beautiful combination – the sweet melon paired with the slightly salty meat. It is light and refreshing. I really enjoyed their version of this dish. 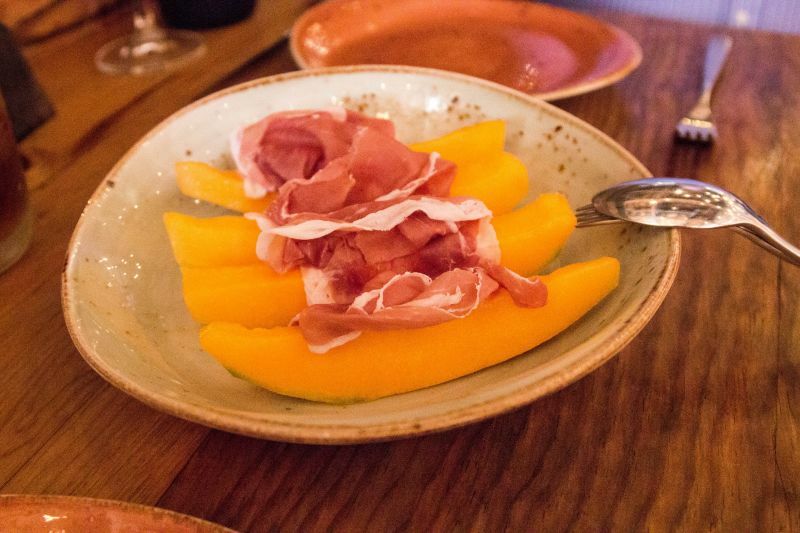 It was simply served perfectly ripe cantaloupe melon slices with the prosciutto on the top. Beautiful! It was then I noticed the cutlery we were eating with. The knife with which we were provided had a very unusual and not particularly well balanced handle. Cutting with it and using it was a bit of a pain and I nearly dropped it several times trying to cut my food and rest it on my plate. I have to say that was a bit weird, but I can’t fault them for it because if you say one thing about the Italians, they love style over function any time. I also have to comment on the seating; very hard wood seats that started to make my bottom ache after about fifteen minutes of sitting. They were attractive, but uncomfortable. I don’t think I would want to linger and dine in this place. 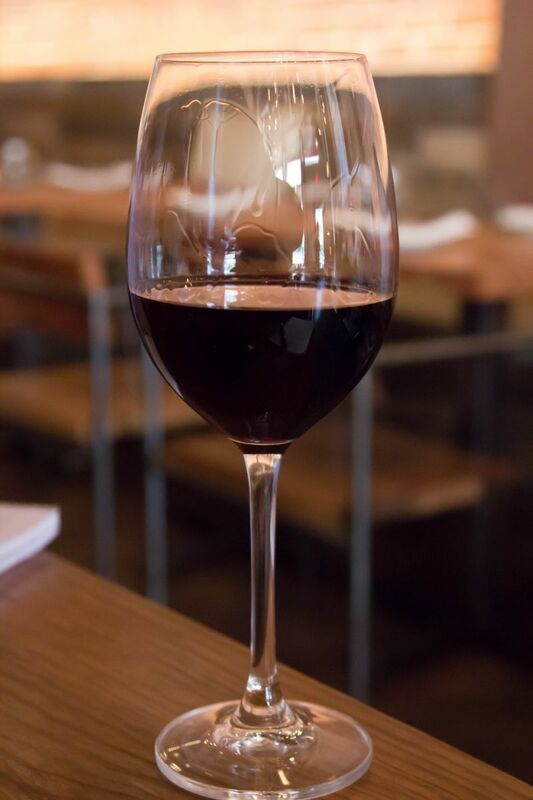 On this occasion The Brit ordered a glass of the house Ca’ Momi’s Rosso di Napa. The wine was fine. There was little character to it, although not objectionable. Bland would be a good word to describe it. I did not order a glass of wine and stuck to water, although I did have a sip or two of his glass. We couldn’t resist ordering the pizza so that we could experience this culinary genius that was touted. I ordered the Montanara, The Brit ordered the Norcina. When our food arrived it looked and smelled great. My pizza had an unusual fried dough crust and was much thicker than The Brit’s thinner, more traditional style version. My pizza also had a thick layer of what was akin to a thick marinara sauce which had a beautiful flavor as opposed to his pizza which was traditional Italian with hardly any sauce. Both pizzas had smoked buffalo mozzarella cheese on them. When I took my first bites of my pizza, I had mixed feelings. The sauce, the cheese, and the toppings on my pizza were beautiful and full of wood smoked flavor. However, the crust was chewy without being crisp and it was a bit tough to get through. The flavor of the crust wasn’t particularly good either. I would not order this again. The Brit’s pizza also had mixed ratings from me. The cook on the pizza was not perfect; the center was under-done, so we got a bit of a doughy mess for the middle. All of the toppings were delicious, but I was kind of surprised with the “sausage”. To me it tasted like ground pork that had been seasoned with simple garlic, salt, and pepper. It didn’t have a deep sausage flavor. The sausage was made by Niman Ranch, but was MEH at best. Honestly, I actually liked the sausage this way, as it was far more mild and blended with the flavors better. (To be clear here, they should have just called it seasoned crumbled pork rather than sausage. I would have been happier with that description.) The flavor on the crust however tasted bland and uninteresting. 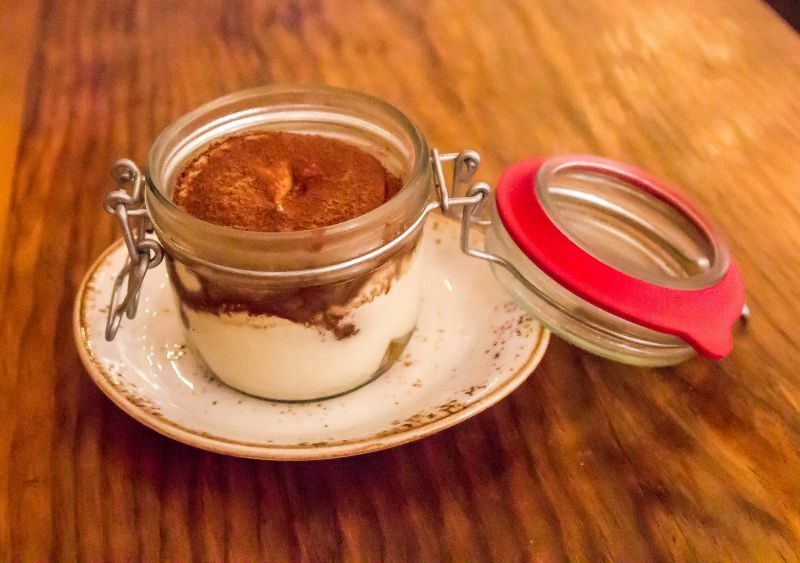 We decided on the Tiramisu for dessert. I really liked the idea of the cannoli, but The Brit won out. I was surprised when a jam jar showed up with the dessert inside. It was fine, I guess, but not what I had been expecting. I was let down by this version of the dessert because I was expecting it to be traditionally made. That is their motto right? In Italy this dessert is always laden with booze. This version was just a tiny bit of light cake, cream filling, with a hint of coffee flavor and chocolate. It was fine, it just wasn’t a yumm. The Brit comments: I shared the surprise at the lack of alcohol, but I felt more kindly inclined to the dessert than did California Girl. It was however, not obsessively authentic, nor was it outstanding enough to justify divergence from the standard. My final verdict on this restaurant? Beautiful space, good service, but I am unsure about their food. 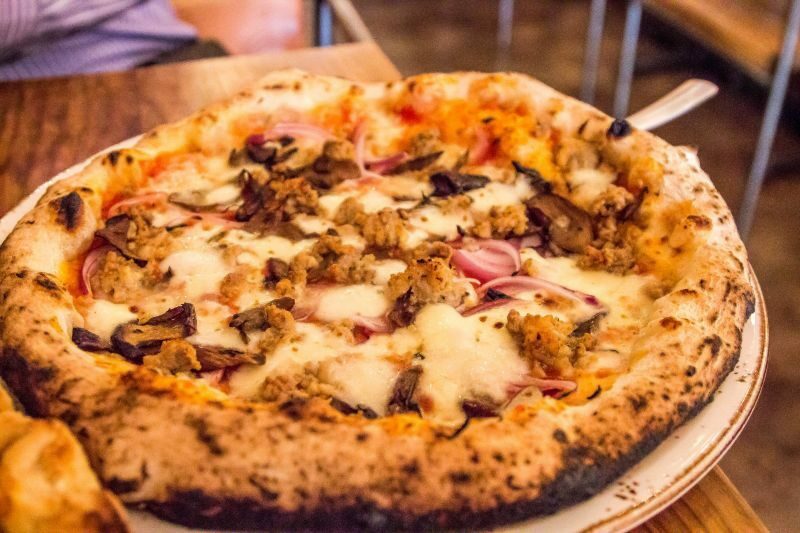 I feel like it is a little unfair to them if we just ate this meal of pizza, which we mostly liked, then turn and say to our readers that this is a restaurant on which to pass. I feel like we need to go back and try their pasta and other dishes to really get a better feel for what they are doing. 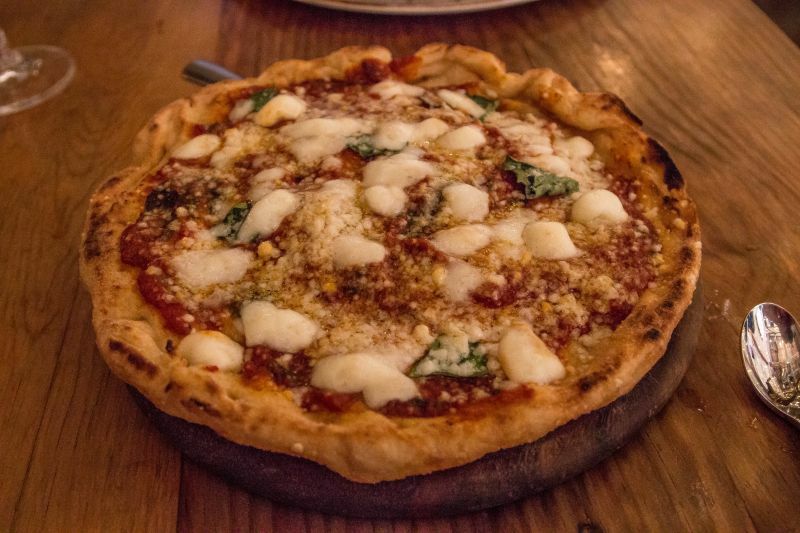 Was it the best pizza in Napa? Um no, but it was tasty and I would eat it again; asking them to cook it a little longer. I will tell you that it was $94 for two small pizzas, an iced tea, a glass of wine, the one appetizer, and one dessert. It was expensive for the quality of the food we ate. I’ve eaten there as well and wholeheartedly agree with your review. I was astounded that there were “no substitutions”. I found that to be rude. There are many people with food allergies or sensitivities, and this seems extremely insensitive and quite egocentric of the restaurant. We had sampled several pizzas, a pasta and main salad, and no one was impressed with their dish. We all thought it was “good” but just that and nothing more. Yet the bill absolutely implied that our meal should have been memorable. The only thing memorable was the bill and the rudeness of our wait staff. My daughter, the one with the food sensitivities could almost eat nothing at this restaurant but the prosciutto and melon which was, as California Girl noted, fresh and in season. Thank you Geni for your comment. At some point I will go back to Ca’Momi, but I am not feeling the need to rush back. We have eaten here also. And I had their Merlot as part of MerlotMe month celebration. We thoroughly enjoyed.